Here's a bunch of wire wrap stud earrings for your viewing pleasure and hopefully will inspire you to create them too. This time around, they are of mix stones. Mostly in natural earthy colors. No reds or orange, the calling for attention type of colors. 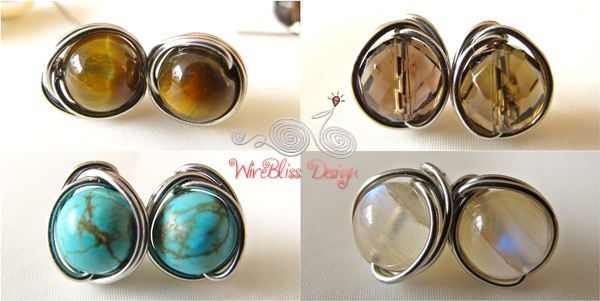 From L-R: pearl, tiger eyes, smoky quartz, turquoise and moonstone. I love these earrings Mei...I bought the tutorial from you in 2009...I've made something similar with the same kind of wire wrapping only with small beads and hung them as dangles instead of studs for something different...fun for sure. So far, studs is more popular over here.